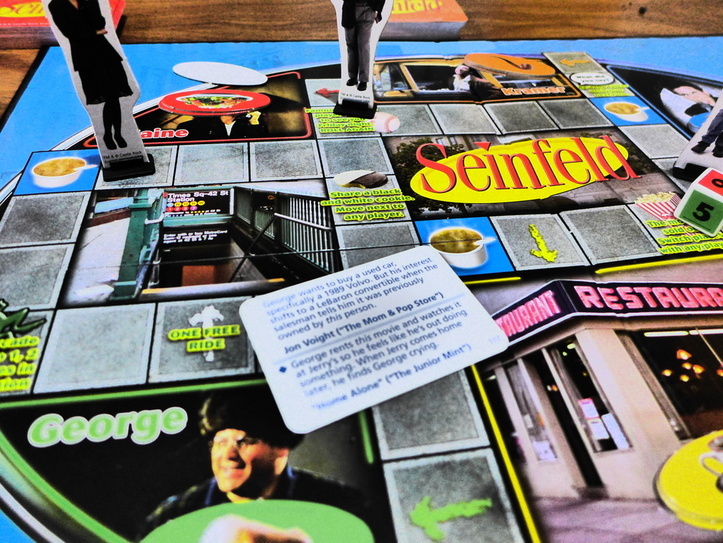 Do you like Seinfeld, trivia, and board games? Chances are pretty good that you do. Now that Seinfeld is on Hulu (yes, all of it), here I am, providing you with information about a much-needed Seinfeld accessory. What good is loving it, if you can’t prove it to your friends? This isn’t just a trivia game, it’s a board game, meaning it is the best of both worlds in nerdery. The game boasts more than 500 trivia questions. The questions come in two forms: easy and hard. However, the difficulty differences are indistinguishable and whether you know the answer will be due to a combination of chance, having even seen that episode (if you’re not a super fan), and memory skills. When you answer the questions, you receive a game piece corresponding to each character. This is a great touch, as the game pieces are cute, and the questions correspond to that character. For example, you visit Elaine by moving around the board. Once you get to her scene, you answer an Elaine-specific trivia question. If you get it right, you get a Big Salad token! If you get it wrong, you are stuck with Elaine until you appease her. The die is weird. The numbers range from 2 to 9 on the d6. The numbers appear to have been carefully considered to make the game balanced, and to ensure that you don’t just jump from success to success and win in 5 minutes. To win, you need all 6 tokens and the soup. 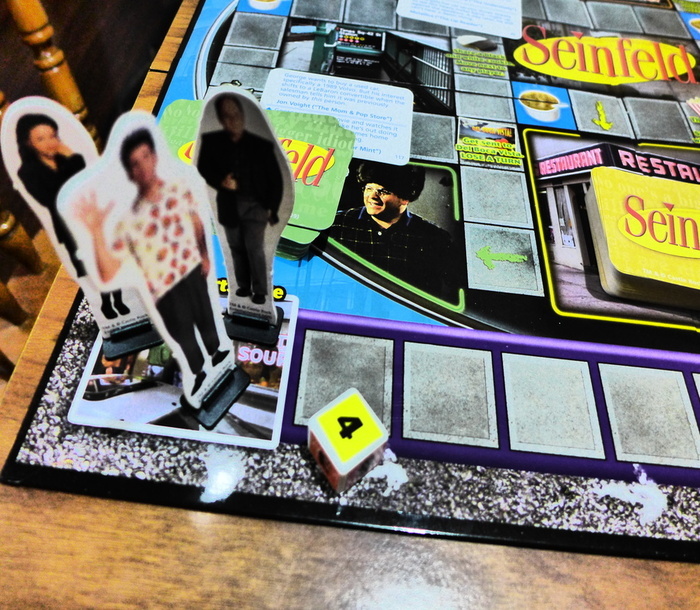 The tokens are received from each board location: Jerry, George, Kramer, Elaine, Everyone Else, and The Diner. 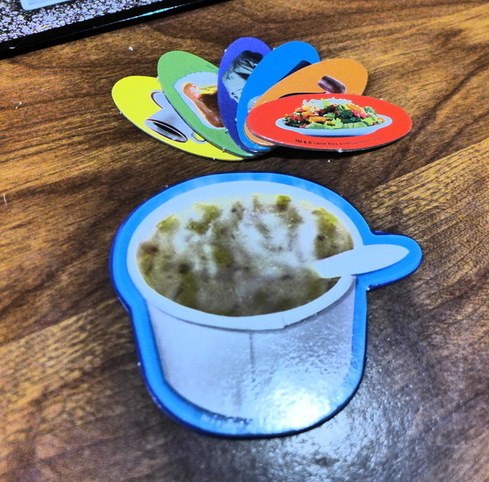 The soup token can be won throughout the game by landing on a soup space. Landing exactly on one starts a Soup Race, which is basically random to see who finishes first. If you roll first, you have the best chance and whoever starts the race rolls first. Is it pointless? Almost, but it adds an extra dimension. It’s a little annoying that you have to move your characters to the Soup Race to do it, memorizing the spot you left. Basically the game is excellent. The gameplay is excellent and fun and the trivia is great, and may even provoke some arguments for die-hard fans. I recommend watching Seinfeld while you play, even though it’s possible it will give an answer or two away. If you’re a Seinfeld expert playing with another, you should always choose the hardest question on the card, regardless of the difficulty designation. Similarly, if you know a lot and your friends don’t, go easy on them! You’ll win anyway. The soup level is random! Previous Eddie Murphy Has 8 Kids!